There are plenty of decisions parents make over the course of a day that can affect their kids' lives, no matter how minimal. Dying their hair pink, mind you, is not usually one of them. 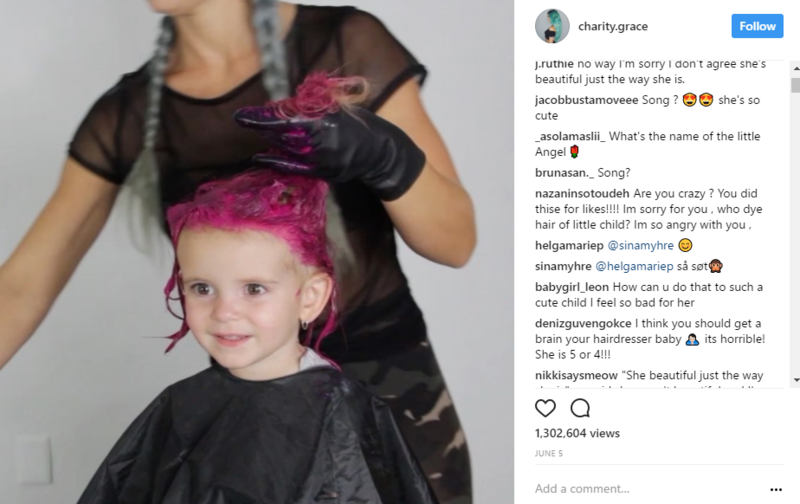 Social media star Charity Grace LeBlanc — she of the Spider-Man workouts — took to Instagram and YouTube at the beginning of June to change her two-year-old daughter Felicity's hair colour from blond to pink — documenting the whole process with a tutorial for folks who want to try it at home. The child's excitement at the choice of hue is palpable, and as LeBlanc notes in the YouTube description, the temporary dye washed out in three to four days. Where the problems started, however, was likely LeBlanc's caption on her Instagram post of the video, which read, "Would you let your daughter do this?" No, half of the Internet wanted her to know. No, they wouldn't. "This is so irresponsible of you. Of course she's going to want it.. Shes a kid! She doesn't know what she wants! And you, the parent should know better! Shes going to be bald by the age of 20," wrote one person. "[Sic throughout] Are you crazy ? You did thise for likes!!!! Im sorry for you , who dye hair of little child? Im so angry with you," typed another. Other, just as vocal, commenters applauded LeBlanc's decision, noting that it's setting her daughter up nicely for the future. "This is exactly how I want my relationships with my future children! For them to be who they want, dress however they want and look however they want as long as they are happy! People probably judge you alot when they see your little girl with colored hair, and say mean or rude things, but you know what, screw them! They have their opinions and thats fine but that doesnt have to put a damper on your life or your little ones lives." Even the company behind the hair dye, Manic Panic, took the time to respond to the haters, explaining exactly why it's safe for kids. "Her hair is already light and not bleached," they commented. "Our dye is vegan and no harsh chemical and condition based....her hair is being hydrated as the color is being deposited." Experts generally don't recommend dying kids' hair until they hit puberty because of its texture and the potential damage that can be caused, but do allow that temporary colours can be an option if a kid really wants them. Come on — who doesn't remember putting Kool-Aid in their hair as a kid? The other pertinent point here is that LeBlanc's hair has been dyed a gorgeous blue hue for years, so for Felicity, colourful locks are the norm, not the exception. From the most recent posts LeBlanc has put up, it seems that the colour is completely gone from the toddler's head, so those concerns (at least) can be put to rest. Like she hashtagged it — #pinkhairdontcare.